The greatest leaders learn from the best to be the best. See how these nine entrepreneurs were intentional about leaving their mark on history and stumbled onto their success. Oprah Gail Winfrey was born into poverty in rural Mississippi. From birth, she faced many challenges such as being raised in the inner city, being molested, having a baby while she was a teenager, and losing her son during infancy to name a few. However, she did let these challenges stop her entrepreneurial spirit. From a local Chicago radio talk show to launching her own internationally syndicated production company to publishing and writing to starring in a variety of movies, Oprah has eclipsed past hardships. She has used these events to fuel her success as an entrepreneur and has become the richest African American of the 21st century. Walt Elias Disney was a farm boy drawing his neighbor’s horse when he started his journey to becoming a successful entrepreneur. On his road to success, he took art classes and pursued jobs that would allow him to learn and develop his gift of being an animator, voice actor, film producer, and entrepreneur. Mr. Disney did not wait for something to happen or for things to fall into place. He made things happen with his intentional action as an entrepreneur, which is why Disney has been so wildly successful. Joanne Kathleen Rowling (Jo) was born in England. She grew up surrounded by books. She has always wanted to be a writer from an early age. She wrote her first book at the age of six and her first novel at age eleven. Before she experienced the success of her first novel in the series of Harry Potter and the Philosopher’s Stone, Jo experienced the death of her mother, birth of her first child, divorce from her first husband, and poverty. Her “rags to riches” life story made her the first billionaire author. Although she no longer has her billionaire status, she is still one of the wealthiest people in the world. Sarah Breedlove (Madam C.J. Walker) was born near Delta, Louisiana. Her parents and older siblings were all enslaved. She was the first child in her family born into freedom. Both of her parents passed away before she was seven leaving her an orphan. She worked different domestic jobs until she was in her thirties. During this time, she started to capitalize on her knowledge of hair and hair products by developing and selling her own beauty products. She is known as “the world’s most successful female entrepreneur of her time,” which also would make her one of the most successful African-American business owners ever. Steve Jobs was born in San Francisco, California. Whether you have an Apple product or not, you have been impacted by the genius of Steve Jobs. The products he was able to create are amazing, but the most remarkable aspect of the life and career of Steve Jobs’ is his self-made entrepreneurship. Steve Jobs was a college dropout and suffered from addiction earlier in his career. At the time of his death, his net worth was in the billions. His ability to become a self-made billionaire puts him in rare company. Andrew Carnegie was Scottish-American. He was born in Dunfermline, Scotland where he lived a small cottage with is family. Eventually, him and his family immigrated to the United States. Carnegie was instrumental in growing and developing the American steel industry in the late 19th century. His successful rise as an entrepreneur is impressive, but his heart to give as a philanthropist surpasses any other accomplishments and achievements. He believed, “The man who dies rich dies disgraced.” He is considered not only one of the richest Americans of all time, but he also is believed to be the largest benefactors of libraries and educational institutions across the country. Benjamin Franklin was born in Boston, Massachusetts. He was one of seventeen children. His father did not have enough money to continue his schooling, so schooling ended when he was ten. His continued education would be achieved through insatiable reading. We all know him as one of the Founding Fathers of the United States. But also Franklin was considered an American polymath because he was a leading author, printer, political theorist, politician, freemason, postmaster, scientist, inventor, humorist, civic activist, statesman, and diplomat. He was an astute businessman and successful in all of these endeavors, which is why he makes the list of being one of the most successful entrepreneurs. John D. Rockefeller was born in Richard, New York. J.D. Rockefeller showed great promise as a entrepreneur when he was a child selling candy and performing odd jobs. His title of being the wealthiest man of all time can be attributed to his oil business. Just as Carnegie was a big philanthropist, J.D. Rockefeller was inspired by Carnegie to donate at least $500 to philanthropic causes. Bill Gates was born in Seattle, Washington. From his childhood, he was expected to become a lawyer like his father. However, Gates had different plans for his life. At age 13, he became fascinated with programming a General Electric (GE) computer in Beginner’s All-purpose Symbolic Instruction Code (BASIC). He wrote his first computer program on this GE computer. This was the start of what would be a beautiful journey. He is famously known as holding positions such as chairman, CEO, and chief software architect at Microsoft, which has been a leader in the software industry since 1975. He has a net worth of $79 billion. Like other famous entrepreneurs, he has donated a fair share of his money to charitable organizations. He has given over $28 billion to philanthropic causes. There isn’t a specific recipe to becoming an entrepreneur, but there are good practices and lessons to be learn from these successful entrepreneurs. 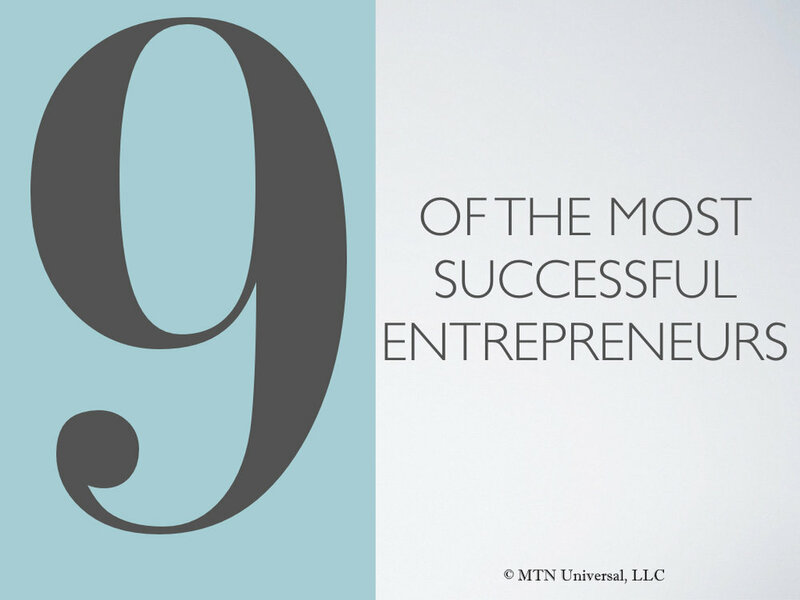 Before any of these entrepreneurs were successful, they faced some of the same challenges that many of us are facing. So next time you question your vision and efforts as an entrepreneur, just remember how many of these people discussed today came from nothing. The difference is that they made the most of the various unfortunate and favorable situations in their lives. Just know that you have what it takes to be a successful entrepreneur. Just be intentional and consistent about being true to your calling. Thank you for reading this article. But before you leave, I would like to know what do you think you need to be a successful entrepreneur? Please do not hesitate to send me your comments, thoughts, and/or anything else you may want to discuss with me. Please leave a comment below or email me directly to share your thoughts.